Embellished Version. Composed by Johann Sebastian Bach (1685-1750). Edited by Alfred Durr. This edition: urtext edition. Paperback. Barenreiter Urtext. Baroque. Collection. With introductory text (does not include words to the songs). BWV 812-817. 64 pages. Baerenreiter Verlag #BA05166. Published by Baerenreiter Verlag (BA.BA05166). 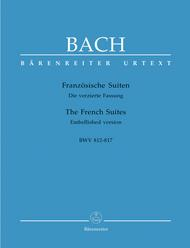 The present volume contains Bach's six French Suites in ther later embellished form. It must be remembered, however, that the printed ornaments are not as authoritative as the musical text itself, therefore it is up to the modern interpreter to choose the ornamentation that suits him or her best. All types of major, minor, diminished, and augmented chords spanning more than an octave. Extensive scale passages. 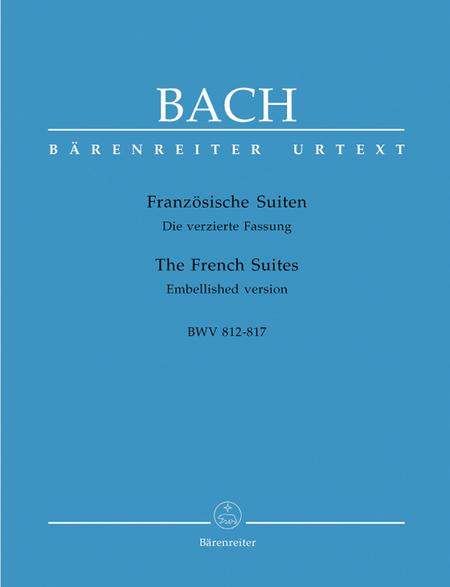 This is a great edition of Bach's French Suites. 19 of 42 people found this review helpful.